So far this weekend I have been working on finishing up Karen’s Neighborhood RR. I really like my choice for this one. All I have left to finish at this point is a few more light green leaves and the stars in the sky. 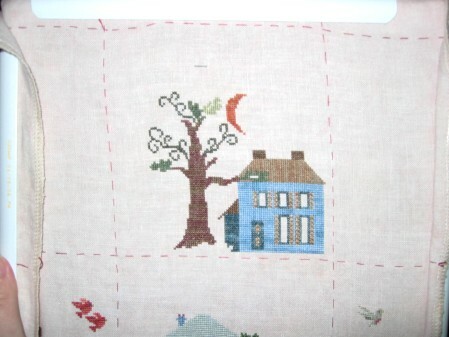 I really hope Karen likes what I have stitched for her. In addition to working on the RR, I had hoped to finish the beading on Stargazer. I ordered the beads I needed from an ONS I have had good luck with in the past, but I have heard nothing about this order since I placed it almost three weeks ago. I also ordered some of the new Miras at the same time. I emailed to try and get an update on the status of the order, but have heard nothing back. If they had the beads in stock, but were waiting on the patterns, I would happily pay extra in shipping to get the beads. In the mean time, I tried to find the beads at a local bead shop. They do not carry mill hills, but I thought I could find something close enough to the beads I was missing to fudge it. No luck…the color I found just isn’t quite close enough. And so I wait on a finish so close I can taste it. Ahhh, one of these days I will be able to show her too you all finished. In the mean time, I will be placing German Garden in my rotation as my focus piece. Even though I am not stitching as much as I would like, I am still pleased with how far I have made it through my proposed rotation, especially with the add ins of RR stitching. I am pretty close to half way with this round and one WIP (Stargazer) that I pretty much consider finished. YEAH! Your block for the RR is coming along beautifully! I hope you can find the beads for Stargazer soon. Your RR block looks great! Hope the ONS gets your Stargazer beads to you soon. Oh, Karen’s RR looks fantastic! She will love it – she is a big Blackbird Designs fan!!! What a shame to have to wait on those beads 😦 I am dying to see Stargazer all finished – I just love that fabric you chose so much! Your block is looking really good. It’s such a dissapointment that you are so close to finishing Stargazer and you can’t get the beads. I am sure that the wait will be worth it though, using the correct beads will make it all look so much better. I love what you have stitched on my RR!!! Thank you so much!! Your block is looking gorgeous! Leslie tell me which beads you need and I will ship them out to you on Tuesday when I get back to the shop, if it’s only one or two it’s my treat. We have all the beads in stock except for magnificas. I will say that Wichelt (Mill Hill’s only distributor) has been running slow since a serious flood they had in the late summer. The RR is looking fantastic! Hope you get your beads soon! That RR is looking just great!